Custom Foot Orthotics are a very good, conservative options with a high success rate. Foot orthotics are custom-molded supports that control the way the foot functions, similar to the way glasses control the way the eyes function to allow the user to see better. Foot orthotics decrease stress to the painful area of the foot. Biomechanics is the science that deals with the study and treatment of problems caused by abnormal motion of the foot or other body part. Orthotics are prescription devices worn within shoes and/or sandals. 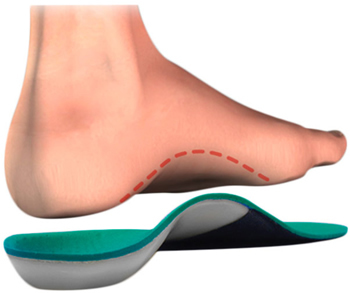 Orthotics control the function of the foot and lower extremity to eliminate abnormal function and stress that causes pain and deformity. We are able to achieve rapid fabrication because of our in-office computerized CAD-CAM orthotics, scanning and milling process. Here the foot is scanned into a computer while held in a corrected position (where the foot will need to function to relieve the painful condition). Prescription software corrections are then made as necessary. This information is then transferred to the computer-milling machine, which produces the orthotic shell. It is hand modified and finished to produce a perfect-fitting prescription device, designed to correct the faulty foot function and relieve foot pain.